One of the best things I find about living in Singapore is getting access to foods that aren’t as common in Australia. I love prata, char siew pork, siew mai and bao, wantan mee, Hainanese chicken rice; I could be here forever. But one of my absolute faves is smoked duck. It is sooooo much cheaper here than back in Melbourne, and I would eat it every day if I could. It’s just so yummy!! I also love quick meals, I have an entire tag devoted to quick and easy recipes. I especially love them when I’m crook with a sinus cold, like today. I wanted something quick for lunch that didn’t result in me hitting up the local Subway. So I made a tortilla pizza, or tortizza, in the airfryer. 5 ingredients, under 15 minutes to make and cook; my kind of meal. It’s also a 1 serve meal, perfect for when you’re the only duck-eater in the family. If you’re not into duck, fear not! Smoked chicken can be used instead, or even leftover roast meat from Sunday’s dinner can be subbed. I made this in my Philips Viva airfryer (not a plug! ), but you can grill this or pop it in the oven. Just adjust the cooking times to suit. I totally devoured this today at lunch, it wasn’t a pretty sight. But it has sooo many of my faves, cooked nicely together. 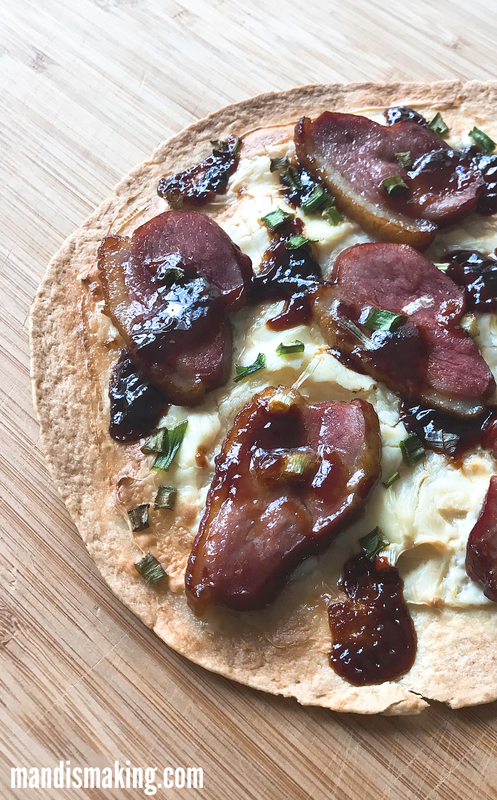 Crispy edged tortilla, smooth cream cheese, velvety smoked duck, a hint of onion, and the salty awesome tang of hoisin sauce that ties it all together. I’m drooling, I want to eat it again! Preheat airfryer with grill or griddle attachment for 3 minutes on 200C. 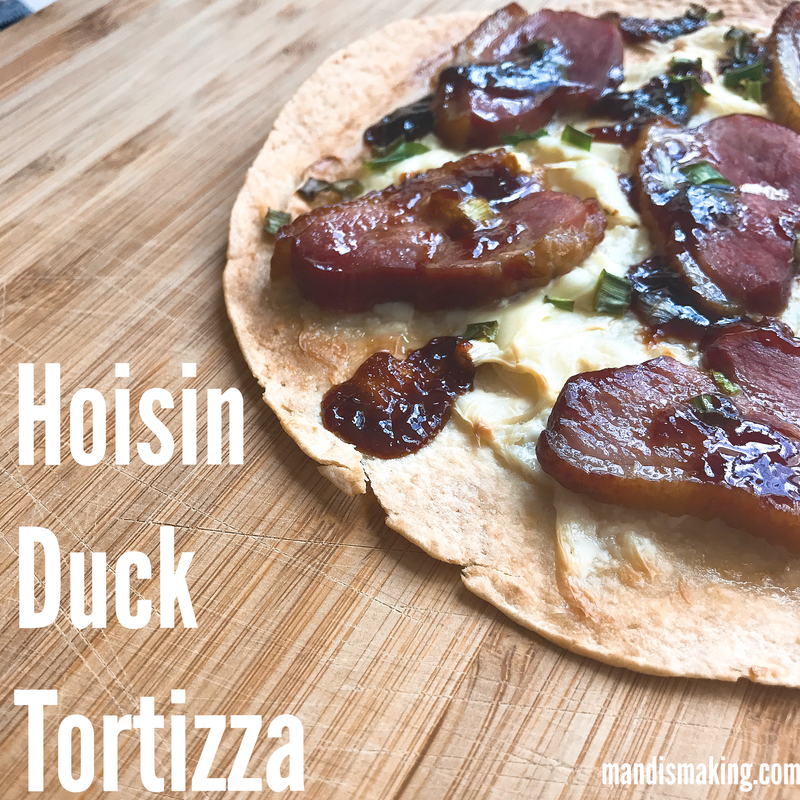 Spread cream cheese on tortilla, top with duck and spring onion, drizzle over hoisin sauce. Turn airfryer down to 160C; place tortizza on grill attachment and cook for 8-10 minutes. Notes: smoked duck can be substituted with other meat. This can also be cooked in the oven or under a grill, just adjust cooking times accordingly.